Your guests are sure to love this trendy and useful wedding favor! 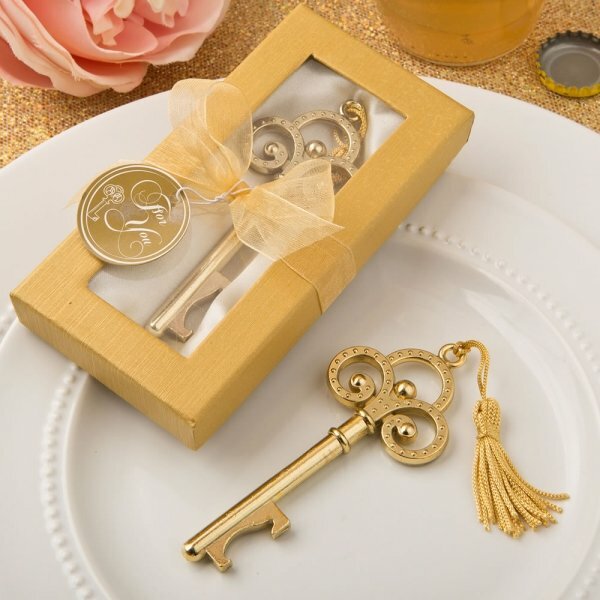 Our Gold Vintage Skeleton Key Bottle Openers are the perfect addition to your event and a thoughtful way to tell your friends and family "thank you" for sharing in your day. A matching gift box holds a classic skeleton key shaped bottle opener crafted from sturdy caste metal with a shiny gold finish. The top of the key is decorated with an intricate ringed design and beaded texture. Attached to the top of the key is a golden tassel for added style. Product dimensions: 4" x 1.5". Can I put a logo on this bottle opener? Unfortunately, the Gold Vintage Skeleton Key Bottle Opener can't be personalized. Also, only the design options listed on our site are available. I'm sorry, we're not able to accept other images, photos or logos. Is it possible to have the tag personalized? We don't have personalization available with the Gold Vintage Skeleton Key Bottle Opener, but we do sell personalized tags separately here.